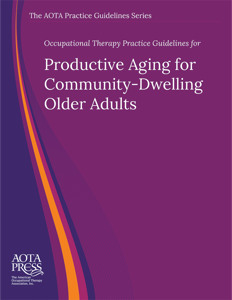 This Practice Guideline provides an overview of the occupational therapy process for community-dwelling older adults. It is based on systematic reviews of the evidence for interventions addressing ADLs; IADLs; social and leisure participation; sleep; fall prevention; and health promotion, management, and maintenance. It uses key concepts from the 3rd edition of the Occupational Therapy Practice Framework: Domain and Process and is essential for clinical decision making in occupational therapy practice with community-dwelling older adults.